Roleplaying on the Final Frontier using the d20 modern rules. The universe you love comes to the game system you already know! 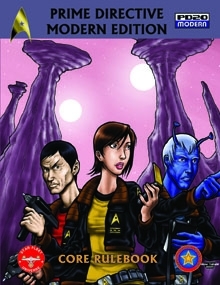 Brilliantly compiled by Jonathan M. Thompson, Prime Directive PD20 Modern allows you to take the heroic role of a starship captain, a commando, a diplomat, a spy, or a trader flying a shuttle of tribbles from planet to planet. This book requires that you have the d20 Modern rules, which are available elsewhere. This title was added to our catalog on January 31, 2011.